For a Hollywood movie star, wow, Reese Witherspoon is making a hell of a lot of sense. The fresh-faced 35 year old actress is doing the rounds to promote her new film Water For Elephants - out any day now - in which she co-stars with reluctant teen dream, Robert Pattison. "Certain people are systematically ripping feminism down because of their lack of regard and their ignorance about what the women before us had to go through. I don't think these women are stupid. I think they're selling a personality that's very marketable: 'Wouldn't it be fun if we were all gorgeous and didn't have a care?' But creating a cultural icon out of someone who goes, 'I'm stupid, isn't it cute?' makes me want to throw daggers at them! I want to say to them, 'My grandma and mother did not fight for what they fought for so you can start telling women it's fun to be stupid.' Saying that to young women, little girls, my daughter? It's not okay." “What gets me is how many women – young women – give up their power and their sense of self. Thinking they’re going to get more out of life if they take off their clothes and objectify themselves, instead of functioning on the principle that they’re smart and capable, that you can be an actress and not be on the covers of T&A magazines. I’m flabbergasted by how many legitimate actresses do that. It blows my mind." What do you think of Reese, boring or brilliant? Or somewhere in between? "Im stupid, isn't it cute?" from the lady responsible for the legally blonde films? Ha. But yes. i agree. ten points Reese. Well said. Elle's not dumb! She's a Harvard educated lawyer! Who just wears a lot of pink. "For Robyn R.Warhol, professor of English and a feminist theorist at the University of Vermont, Elle is what she calls a post-modern feminist heroine. "Everyone laughs at her because everyone else is wearing a blue or green suit and she's wearing pink, but that's who she is," Warhol says. So what if she has perceived "effeminate" characteristics? Those should not be considered inferior or a pejorative." 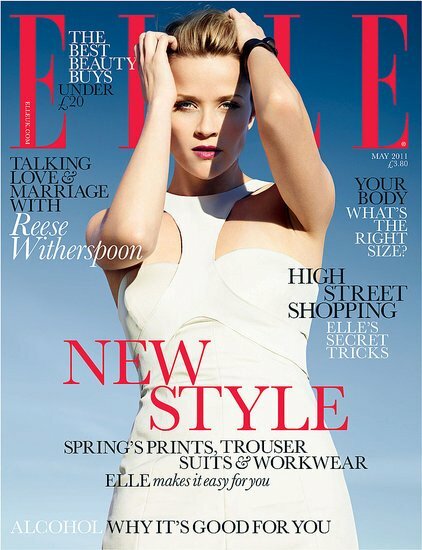 I quite like Reese Witherspoon, and I thought that interview in Elle was good, if a little . . . ill-tempered? She seemed to kind of be tolerating the interviewer throughout. But the photographs were beyond odd. In one she looked like a skeleton, and in the others she looked like a linebacker. It's not difficult to make her look gorgeous so I don't get why they didn't. Bloody refreshing, is what it is! Well done, Reese. Is it strange that I find her boringly brilliant? Yes she speaks a lot of sense but there's still something about her that I find a bit meh. Amen Reese. Really great interview. I like her- she seems so down-to-earth and she has a fresh and refreshing look. So I think she cuts a positive figure in the Hollywood scene. I love this lady even more now. Good on you, Witherspoon! I like her I must admit. She is certainly talking alot of sense here. God, can't believe she is 35 already !